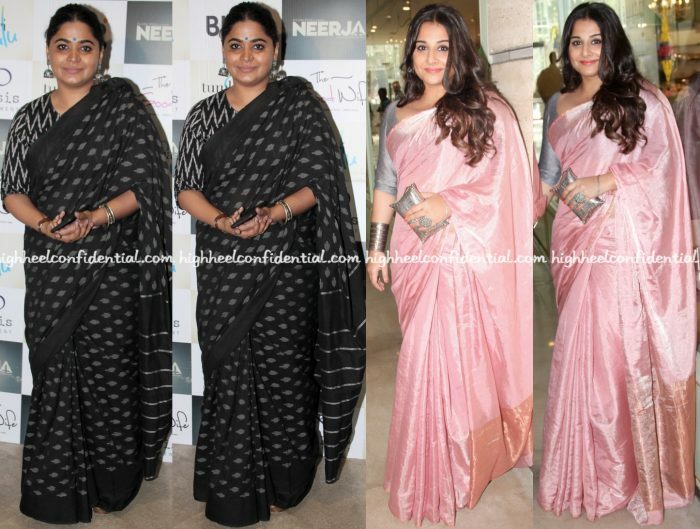 While at an event celebrating the success of a recent movie, both Ashwiny and Vidya were photographed wearing saris, a look right up their alley. The lovely ladies looked nice. P.S: Vidya paired her Anavila sari with jewelry from Amrapali. Vidya looks lovely but I wish Ashwiny had been a bit more creative with the saree — a brighter, contrasting blouse, more interesting jewellery — that’s a saree begging to be dressed up, experimented with. Vidya looks lovely! 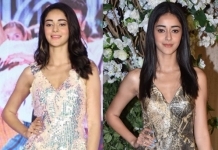 The clutch has given that left hand something to do, hence it does not look awkward this time! Vidya looks great here. The muted colors suit her. Glad she’s over the chunky statement necklace phase. I love the steel grey with the pink combo on Vidya. She looks nice. I like Vidya’s combo. The clutch is a nice touch. I like Ashwany’s ensemble also.Love the weave. Ashwiny resembles Payal(P&P). :D For a change, Vidya looks neat & tidy. They are both looking lovely! Love Vidya’s saree and she looks absolutely gorgeous. Ashwany’s saree is equally beautiful. I like the print mixing with the black and white sari, and Vidya looks gorgeous. The pink sari is lovely. Her hair looks fab too.